You're at a birthday party and no one is having any fun. The host is trying, but their idea for the party isn't working out. She's made a cake from scratch with homemade frosting and fondant, the deviled eggs were whipped to perfection, and the room is packed with five year olds. What could go wrong? In our case, it was a karaoke party, which is tough for five year olds...since none of them can read that fast. 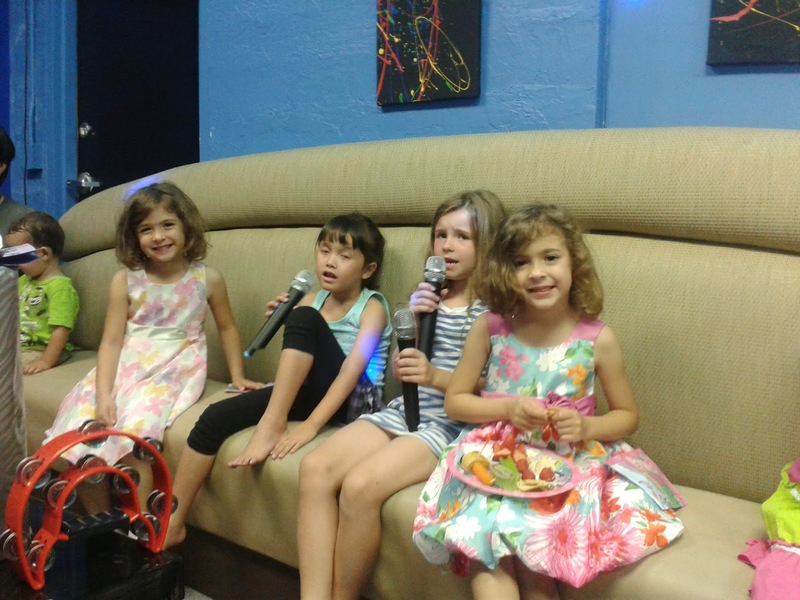 When the girls first arrived, they improvised, grabbing the microphones and having a loud conversation with the birthday girl, who also had a microphone. The dad, understandably stressed while trying to figure out the complicated karaoke machine, told everyone that the microphones were for singing songs, not for talking. And we ended up with silence. Everyone put down the mics and stared at him. Fast forward, and after a few kids walk in who are too shy to sing, everyone decides it's embarrassing to sing, and song after loud pop song plays to a wall of sullen children. No one is having a good time, and the hosts look like they're about to cry. I have no embarrassment meter, so who better to try to save this sinking ship? Since none of the kids could sing or wanted to sing at that moment, I tried the dancing route. Now, I am a horrible dancer. Like, the worst. So it made it look silly and fun to the kids (I hope). Anyway, I convinced one of the twins to dance with me. And no one joined us. After the song, I looked at the peanut gallery of parents just sitting there and literally said, "thanks a lot, guys." I mean, think about it when you're someone's guest. If you had thrown a party and it was failing, wouldn't you desperately want the other adults in the room to throw you a bone? As I explained to my child when she dragged me out of the room to tell me I'd embarrassed her: It's our job as party goers to have a good time. It is your job, as a party goer, to have a good time. Sometimes, the hosts can't get things going, and they certainly can't with the pressure of everyone else staring them down like, you gonna make this fun or what? My kid and I went back in, after I'd also told her not to worry about what people think, and that everyone else WOULD start to have fun, I promise, and we danced again. And finally, people started to join in. And by the end of the party everyone was dancing and singing and having a good time. And the smile on my kid's face when she said she wasn't embarrassed anymore may have been the highlight of my life. So, when you go to a birthday party, try to help a mother out! You know you'd want someone to do it for you. My Five Year Old Is NOT a "Strong Leader"
Ask a Teacher - How Do I Get My Child to Behave?